Brno is the second largest city in the Czech Republic, located in the southeast of the country. It was founded in 1243, although the area had been settled since the 5th century. As of August 2009 the population is 404,887. Brno is the capital of the South Moravian Region as well as the seat of the Constitutional Court of the Czech Republic, the Supreme Court, the Supreme Administrative Court, the Supreme Prosecutor's Office and the Ombudsman. Brno is located in the southeastern part of the country, at the confluence of the Svitava and Svratka rivers. The city is a political and cultural hub of the South Moravian Region (estimated population of 1,130,000 for the whole region). At the same time, it represents the centre of the province of Moravia, one of the historic lands of the Bohemian Crown. It is situated at the crossroads of ancient trade routes which have joined northern and southern European civilizations for centuries. Due to its location between the Bohemian-Moravian Highlands and the Southern Moravian lowlands, Brno has a moderate climate. Situated in the city of Brno, in the Czech Republic, the Arte Hotel enjoys a convenient location steps from Lužánky Park (the main park in town) and from the renowned Villa Tugendhat (7 minutes on foot), but also a few minutes by car from the Brno Exhibition Centre. This luxury 4-star hotel in Brno is the ideal place to stay if you are looking for excellent accommodations in this beautiful town. The soothing atmosphere created by the interior details will delight guests, and the hotel staff will be pleased to satisfy any need, from guided tours to tickets purchase. Just a few min. from City Centre and 10 km from Brno International Airport , the hotel can be easily reached from main Czech highway, so you will spend less time in traffic and more time doing what you came to do in Brno. 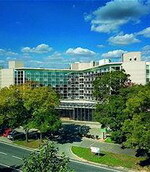 Holiday Inn Brno is situated close to many corporate headquarters. In the vicinity are some of Brno´s most delightful sights such as Spielberk Castle, Gothic Cathedral and Town hall . Weather you are coming to Brno for business, meeting, conference or just for fun your hotel room at the Holiday Inn Brno is your personal retreat. Experience fine dining at one of the best restaurants in Brno – restaurant Prominent, where you can enjoy your meal in a romantic atmosphere with personal service touch and today´s sophisticated cuisine. Ceske Budejovice, German: Budweis or Böhmisch Budweis, often referred to simply as Budweis in English; Polish: Czeskie Budziejowice) is a city in the Czech Republic. It is the largest city in the South Bohemian Region and is the political and commercial capital of the region and centre of the Roman Catholic Diocese of Ceske Budejovice and of the University of South Bohemia. The town is not to be confused with Moravské Budejovice in Moravia. The old town preserves interesting architecture from Gothic, Renaissance, Baroque and 19th century period. This includes buildings around the large town square, the old town hall with murals and bronze gargoyles, and the town tower "Cerna Vez" ("Black Tower"). In the new town the Belle Epoque Austro-Hungarian train station is notable. The most valuable historical building in Ceske Budejovice is Dominican convent with Gothic church Presentation of Virgin Mary on Piaristic square. The horse-drawn railroad line connecting Ceske Budejovice to Linz was the oldest public line in continental Europe (after the line St.Etienne-Andrexieux in France), constructed from 1824 to 1832; mere traces of the line can be seen south of the city center. The ruins of the home castle of the Czech national hero Jan Žižka, Trocnov, are located some ten kilometres southeast from the town. A bit further away (approximately 30 km), the enchanting town of Cesky Krumlov is another compulsory stop for the visitor of South Bohemia. In 1992, it was added to UNESCO list of World Heritage Sites. 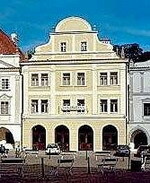 The Hotel Dvorák is in the historical centre of Tábor, near Zižkovo námestí. It opened not long ago, in 2004, following very interesting modernisation work on the historical building of the Tábor brewery, right next to the remains of 14th century Kotnov castle. After Ceské Budejovice, Tábor is the largest town in South Bohemia and also the most important cultural, transport, commercial and tourist centre in the region. It's historical centre has been declared a City Monument Reservation. Cesky Krumlov - German: Krummau an der Moldau or Böhmisch Krummau; Krumau variant is used sometimes; Latin: Crumlaw) is a small city in the South Bohemian Region of the Czech Republic, best known for the fine architecture and art of the historic old town and Cesky Krumlov Castle. Old Cesky Krumlov is a UNESCO World Heritage Site and was given this status along with the historic Prague castle district. The Old Inn Hotel is comprised of three restored historic townhouses overlooking central square in the heart of Cesky Krumlov's old town. This 3 storey hotel features 52 guestrooms, all of which include a traditional white decor with floral fabrics and antique furnishings. All rooms have in-room safes, internet access (surcharge), cable television and minibars. The Old Inn Restaurant offers a buffet breakfast and all- day menu served in a relaxed rustic ambience, with the option of eating on a large garden terrace. Alternatively there is Katakombv Restaurant, which offers Czech Specialities, including spit-roasted meats and Pilsner beers, served in the vaults of a 13th century beer cellar. 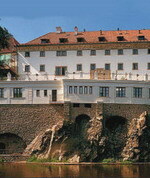 Built in the sixteenth century as a Jesuit Monastery, the Hotel Ruze overlooks the River Moldau in the historic town centre of Cesky Krumlow, a UNESCO World Cultural Heritage city. The hotel conserves its renaissance style in the décor of its rooms and public spaces. Modern fitness equipment at the hotel includes an indoor pool with counter-current, gym, sauna and solarium. Business travellers can take advantage of conference facilities combining renaissance settings with modern audio-visual equipment. Dining can also be a historic experience, with chefs in traditional historic costume roasting meat over an open fire in the restaurant; meals can also be enjoyed al fresco with views on the river terrace. Karlovy Vary is a spa city situated in western Bohemia, Czech Republic, on the confluence of the rivers Ohre and Teplá, approximately 130 km (80.78 miles) west of Prague. 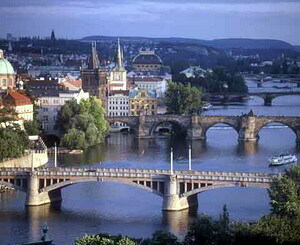 It is named after King of Bohemia and Holy Roman Emperor Charles IV, who founded the city in 1370. It is historically famous for its hot springs (13 main springs, about 300 smaller springs, and the warm-water Teplá River). The Hotel Derby is a 4-storey hotel located in the famous Spa town of Karlovy Vary, 200 metres from the Spa Colonnade and 4 kilometres from Karlovy Vary Golf Course. Prague Ruzyne Airport (Prg) is 120 kilometres away and takes around 105 minutes by car. The hotel features an onsite sauna and a hot tub, and drinks are available at the bar. Guests of Hotel Derby wake up to a complimentary buffet breakfast each morning. 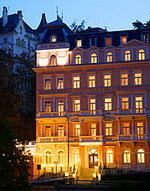 The Spa Colonnade is home to Vrídlo, the most spectacular thermal spring of Karlovy Vary. Every two to three seconds a 12 metre-high jet of water at a temperature of 72°c shoots out from a depth of 2000m below the earth's surface. 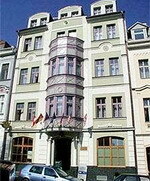 Hotel Elefant is located in Karlovy Vary in the Czech Republic, 20 kilometres away from Loket Castle and 26 kilometres away from Becov Castle. Central Marianske Lazne is 55 kilometres away. This hotel dates from the 18th century and features art nouveau-style furnishings throughout. 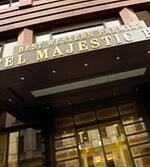 Staff at Hotel Elefant offer tour assistance, and the front desk has a safe-deposit box. The property also features a massage-treatment room, and nearby secure parking is available. A complimentary buffet-style breakfast is provided daily, and the onsite restaurant offers an international menu featuring regional Czech specialities. The guestrooms all feature refrigerators, direct-dial phones, and satellite television. The Humboldt Park Hotel & Spa is a restored 19th century grand villa, specialising in luxurious spa treatments and situated in Karlovy Vary 1 kilometre from the train station and 80 kilometres from Prague. Professional physicians and therapists are on hand to advise on the use of thermal springs and plan individual health treatments, including thermal baths, aromatherapy and lymphatic drainage. Alternatively guests can unwind with a sauna, steam, whirlpool and swim. The gym is complete with the latest cardio-vascular equipment. The Restaurant Alexander prepares light fresh meals, using produce from the local market, in accordance with guests' wellness programmes. 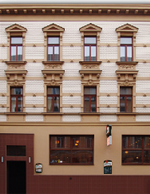 One building was in the past tenement house where was born famous Czech writer Jaroslav Hasek. 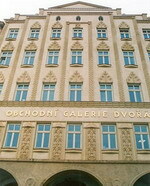 All 50 rooms situated in this building have high roofs with special paintings. Rooms are decorated in the Biedermeir style. The second building, with the main entrance from the Stepanska street, was before reconstruction first office building built up at the beginning of 20th century. In the middle of the hotel complex is situated a small courtyard with beautiful flowers, where our guests can relax in a small open Cafe. There can be served coffee breaks during your conferences or welcome drinks at the beginning of your social events. Euroagentur Hotel Downtown is located in Prague City Centre, Czech Republic, 350 metres from Wenceslas Square, 1 kilometre from the Old Town, and 2 kilometres from Charles Bridge. The nearest metro station to the hotel is Muzeum, 150 metres away. This grand corner property opens to a colourful interior with modern stained-glass windows. The wellness centre features a sauna, two spa tubs, and relaxation beds (surcharge for use). Parking is available next to the hotel (surcharge). Tour assistance and a currency exchange service are also available at the 24-hour front desk. 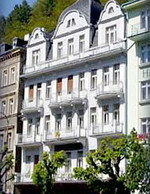 Euroagentur Hotel Downtown serves a complimentary breakfast each morning. At the heart of the “Golden City”, just a short walk from Wenceslas Square, you’ll find the welcoming facade of this lively and friendly hotel. 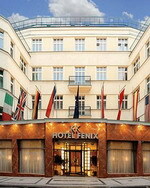 The impressive architecture in the “Prague Modern” style, fronts a stylish hotel with a cheerful and exclusive atmosphere. The location – quiet but central – means this is the perfect place to stay for business and tourists alike. Many of Prague’s best-known tourist attractions, museums, shops and restaurants are just minutes away from the hotel, as is the city’s business center. 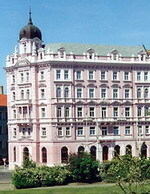 The Neo-Renaissance building of the hotel OPERA was built in 1890 in the centre of Prague's "New Town". The two main reconstructions of the hotel were undertaken in 1935-38 and in 1994-97. The hotel is located at a five minutes walk from the historic Old Town of Prague and approximately 100 metres from the hotel is the subway and main bus station "Florenc". 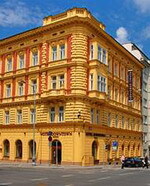 The restaurant of the Hotel Opera serves Czech as well as international specialities in a pleasant atmosphere. In addition to the restaurant, there is also a separate bar, which enables our guests to sample the Czech Republic`s world famous beer and other local drinks such as Becherovka after a full day of sightseeing. Other hotel amenities include room, concierge, business and valet parking services, a dry sauna and fitness room and private meeting rooms available for business and social functions. For many people, there's no way to get to know a new city better than simply immersing yourself in it; heading out for walks, exploring all the nooks and crannies you might traditionally ignore and enjoying being surrounded by the local atmosphere of the city's inhabitants. It's certainly true that this is a fantastic way to get to know Prague in a short amount of time, but there's a lot to be said for alternative ways by which you can gain an even deeper knowledge without much more effort. Every city that enjoys a good tourism industry has the one thing that many tourists like to do best - sightseeing tours. Prague is no different from the rest, except in one way - it is one of the best cities to partake in a tour or two in Europe. This is because Prague is packed with numerous tours varying all throughout the spectrum of tastes, meaning that you're guaranteed to find at least one that caters to what you're interested in finding out about. 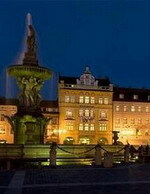 For example, as well as the traditional sightseeing tours that can be enjoyed by coach, bus or on foot that take you around the city's biggest historical sites and significant views, you'll also find many tours offering information on specific subjects that those who have an interest in a certain aspect of Prague are sure to love. These include tours that head out of the city centre to the countryside for a day of adventure, exploring hiking routes, abandoned castles and ancient historical sites; art and architecture tours concentrating on the city's gorgeous buildings; tours that centre on Prague's spookier side to reveal the city's best ghost stories and even several free tours conducted by volunteer guides who simply have to share their love of the city. Perhaps unsurprisingly, you'll also be able to indulge in one of several pub crawl tours, where tourists can discover the Prague nightlife in style with the chance to hit open bars, the best pubs and the nightclubs that only the locals know about. Taking in a few tours are by far one of the best ways to get to know a city. With a massive amount of knowledge on offer with little effort involved, tours in Prague are bound to teach you plenty about the city, its history and its culture. Best of all, you'll be able to return to central Prague hotels following a long day's touring knowing you more than deserve a great night's sleep.